Bethany House Publishers, 9780764211690, 363pp. 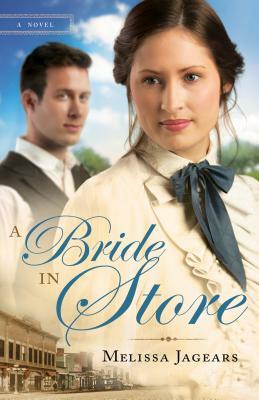 "Mail-order bride Eliza Cantrell is on her way to meet her intended groom and help him grow his general store business when her train is held up by robbers and she loses her dowry. She's further thwarted upon arriving in Salt Flatts only to find Axel, her groom, away on business. Hoping a wife would push Axel to become a better business partner, William Stanton had encouraged him to seek a mail-order bride. With Axel gone, Will feels responsible for Eliza, so he finds her a place to stay and lets her help in the store. Working together isn't what they'd expected, and when Axel is further delayed, neither can ignore the sparks that fly. But Eliza is meant for Axel and is set on a future with the store, while Will is biding time until he can afford medical school. Their troubles are far from over when Axel returns to town, however, and soon both Will and Eliza must decide what they're willing to sacrifice to chase their dreams--or if God has a new dream in store for them both. Melissa Jagears, an ESL teacher by trade and the author of A Bride for Keeps, is a stay-at-home mother on a tiny Kansas farm with a fixer-upper house. She's a member of ACFW and CROWN fiction marketing, and her passion is to help Christian believers mature in their faith and judge rightly. Find her online at www.melissajagears.com.